At Rinehardt Law Firm, we represent the rights and interests of those who have been injured by the negligence or wrongdoing of another. As qualified, experienced personal injury attorneys, we handle cases in Ontario, Ohio, as well as Mansfield and the Columbus metropolitan area. Our practice areas include nursing home neglect injuries, medical malpractice, motor vehicle accidents, workplace injuries, slips and falls, bike accidents, dog bites, child injuries, pedestrian accidents, sexual assault, food poisoning, swimming pool accident prevention and automatic door accidents. We protect the rights of the injured through the steps of medical treatment, negotiation, pre-litigation statements, filing a lawsuit, discovery and depositions, mediation and a jury trial if necessary. As members of the Million Dollar and Multi-Million Dollar Advocates Forums, we have an Avvo "Superb" rating, and for our high ethical standards and success, our law firm holds the highest peer rating possible of AV Preeminent* from Martindale-Hubbell. Our founder, John Rinehardt, is certified as a Civil Trial Advocate by the National Board of Trial Advocacy. Because our clients are so important to us, we are available 24/7 to answer questions, and we offer individual attention and fast results to those whose lives are disrupted by a personal injury. Our proven experience, solid relationships and good communication methods have made us one of the most referred firms in the area. 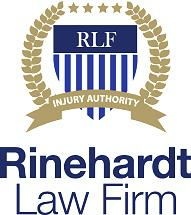 With a long list of successful results, Rinehardt Law Firm is proud to have handled such cases as an auto and truck collision that resulted in $3.1 million for our client, a workplace injury that resulted in a $1.2 award for our client and the wrongful death case that ended in a favorable jury verdict for $5.2 million. Our attorneys are happy to offer potential clients a free initial consultation at our office.